The concept of what I think of as Global Guilds is as much a Process as it is a loose confederation of Organizations. And, in terms of world governance (as opposed to the self-interests of its members) it is a process of last resort – because only globally-defined crises are unsolvable using existing political setups. Everything else can, at least in principle, stay as it is. Realistically, the unelected power of Global Guilds over national governments would only be accepted within that context anyway. The primary purpose of the Global Guilds is to create the conditions needed to allow businesses to reduce their vulnerability to backlashes by minimizing the global crises that exacerbate them. That is of immediate benefit to the organizations themselves. But minimizing global crises ultimately benefits everybody. In order to make enough difference though, the Global Guilds must be formed around not just those components of the world economy that are at greatest risk, but at their core must be the most powerful organizations that are at risk. Based on all the crises analyzed in this book, that suggests that the six most important Global Guilds for the foreseeable future will be the High-Tech Guild, the Banking Guild, the Media Guild, the Energy Guild, the Marine Guild and the Land Guild (which, for example, would include many parts of the Food and Drink industries). And, in an ideal world, there would also be the equivalent of a Politics Guild and a Faith Guild added to the mix, though they could tie in through other means as well. That just about does it. It makes more sense for less-powerful industries that are nevertheless exposed to extreme threats of backlash, such as Education, to belong to one of the powerful Guilds (in Education’s case, probably Media) rather than form a weak independent Guild that cannot hold its own. As it is, in the spirit of maintaining a Holistic Perspective, any given organization should probably have a primary affiliation with one Guild, but also maintain two secondary affiliations with other Guilds. For instance, an oil-multinational would have its first allegiance to the Energy Guild, but might also belong to the Land Guild and the Marine Guild. Similarly, a computer-software multinational might major in the High-Tech Guild but also minor in Media and Banking. And an automotive manufacturer might major in High-Tech and minor in Energy and Land. More broadly, Global Guilds must not only tie into the most critical corporations, but also into the most relevant government institutions, civil groups and even religious bodies. 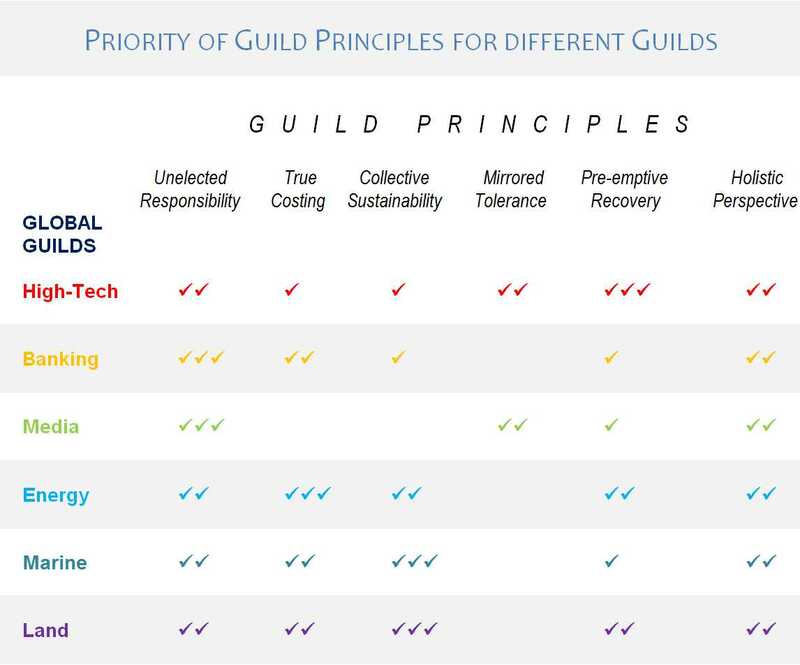 By the very nature of what is driving the growth in turbulence across the world economy, all Guilds must link strongly with the High-Tech Guild. And, given that sustained change can only ever happen when sufficient numbers of the general population start behaving in new ways, all the Guilds must crucially also tie into key members of the Media Guild so that the public can be directly involved. Part of each Guild’s role is to help members realign their activities to minimize backlashes in the ways already discussed in the previous chapters of this book. In practice, all industries need to embrace a Holistic Perspective and, to slightly varying degrees, accept their Unelected Responsibility. However, the priorities of the other Principles (True Costing and so forth) will vary across the different Guilds. Nevertheless, the overarching role of the Global Guilds is far more than just instilling the Guild Principles. Forming Global Guilds is a means of providing sufficient world-governance to align efforts aimed at avoiding dangerous crises, despite the shortfalls in our existing political infrastructure. Sticking with the oil-tankers metaphor, the Global Guilds are not the various fleets or even the groups of rival tanker-captains. Nor do they represent Seamen’s Unions or Naval Schools. They act for the global economy, as I will now explain, like a sophisticated set of Sat Nav systems.